Working out in a gym gives you access to a wide variety of different exercise equipment, allowing you to regularly change up your workouts to keep your muscles from hitting a plateau. Hopefully you enjoy the gym, because if you're looking to build muscular size, you're going to be there often and for long periods at a time. Building muscle mass takes high volume workouts, which means each of your sessions needs to consist of numerous exercises that target each muscle group. While most of your work will be done in the gym, you'll make bigger strides if you also give your muscles the rest they need and ensure you're properly fueling the muscle-building process. Get into the gym four days per week to lift weights. Your muscles need about 72 hours of rest between muscle-building workouts, so you'll focus on your back, biceps and legs on Mondays and Thursdays, and your chest, shoulders, triceps and core on Tuesdays and Fridays. Using a split routine like this also gives you more time to focus on each muscle group assigned on a particular day. Perform three to five sets of each exercise assigned. Each set should consist of at least eight and up to 20 reps. This may seem like an extremely high volume, but you'll move through each exercise relatively quickly because you should give your muscles just 30 to 90 seconds between each set and exercise. Select three exercises that target each muscle group that you're working on a particular day. For example, if you're working your back, biceps and legs, you should compile a workout that consists of a total of nine exercises. Exercises that target your chest include bench press, dumbbell chest press and pushups. For your shoulders, you could complete military press, dumbbell shoulder press and lateral raise. Work your back with pullup, lat pulldown and seated row. For your biceps, complete dumbbell biceps curl, barbell biceps curl and hammer curl. Hit your triceps with lying triceps extension, overhead triceps extension and kickbacks. You can build your legs with squats, deadlifts, lunges and leg presses. Consume 0.65 to 0.80 grams of lean protein for every pound that you weigh, as recommended by Dr. Joseph A. Chormiak of the National Strength and Conditioning Association. When you're putting on mass, your body needs more protein to fuel the muscle-building process. Eat a meal consisting of protein and carbohydrates immediately after each of your weight training workouts. Doing so supports protein synthesis and reduces the breakdown of protein, which facilitates muscle-building. Be ready with a packed meal if you're unable to get home to eat within 30 minutes of completing your workout. Be active on your rest days. On Wednesdays, Saturdays and Sundays, instead of doing nothing physically active, go for light jogs or walks and get in some static stretching. Doing so will increase blood flow to your muscles, which in turn will facilitate tissue healing. 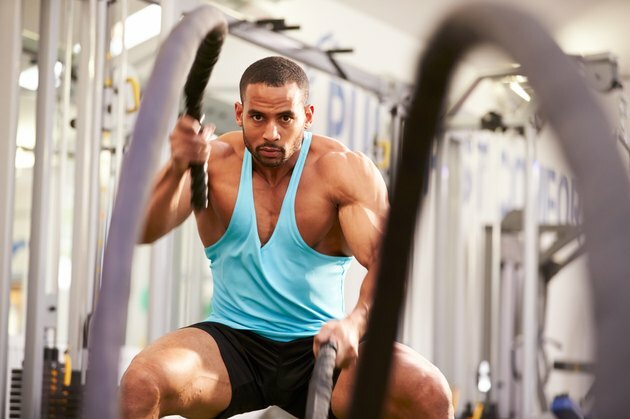 Complete compound exercises, which are activities that require movement at multiple joints, such as bench press and lat pulldown, before moving onto isolation exercises like biceps curl and triceps extension. Compound exercises are more effective at eliciting gains in muscle mass. Recruit another lifter to act as a spotter when you’re performing lifts that involve holding weights over your head or face. Visit your doctor for a physical checkup before starting a new workout program. American Council on Exercise: What Exercises Should I Perform if I'm Trying to Gain Weight? Should I Lift Weights Every Day?